One of the advantages of l-shaped beds is that you can’t feel motion in the bed frame when a kid is climbing up the top bunk. This is handy for kids that are light sleepers when the kid on the top bunk wants to go to the bathroom in the middle of the night. The bottom bed is versatile and can be quickly moved or upgraded from a single to a twin. If you want the children to split rooms in the future, it will keep you from buying new sleeping stations. You can remove the bottom and create extra study and storage space. L-shaped beds are great for kids that feel too confined sleeping underneath the top bunk. As mentioned above you know that the lower section can be rearranged easily. Some designs allow you to move the bed into a position in the same area as the top bunk creating a standard bunk bed. 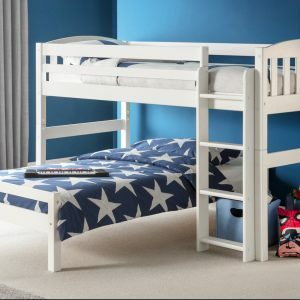 L shaped bunk beds are great for families that need to create different configurations of kids bunk beds in the future. Being a Dublin based company, we offer deliveries as part of our service. If you need more details on our delivery options or to clarify anything about all listed bunk beds, our team will be happy to help you over the phone or email. To further personalise your children’s bedroom consider installing a reading light for the top bunk. It could be a case where one of the kids is falling asleep faster than the other. For example, some kids like to read before going to bed and may have different night time routines. Light is also practical for the middle of the night bathroom trips illuminating the ladder for extra safety. For the kids that may feel enclosed sleeping on the bottom bunk, consider installing the bed opposite a window. Window light will make it easier for kids to wake up in the morning and make it more comfortable for kids by brightening up their bottom bunks. A final tip to add character into your children’s room decor is to wall panel the wall behind the bunk bed. It’s a way of making the room visually clean, tidy and sophisticated.